A dark blue cross edged in gold divides this light blue pin. The initials "RCIA" are printed in gold in the lower right quadrant. Symbols of the Sacraments of Initiation-- water (Baptism), fire (Confirmation), and a cup and bread (Eucharist)-- are elegantly done in red, gold, and blue. 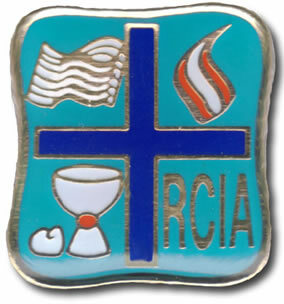 This Pin is also the LOGO for JP II RCIA Resources.